Imagine this for a while: You are working on a very important document where there’s a sudden power outage and your PC shutdowns. And when you try to boot it up, the file that you are working on cannot be found. Imagine all those days or probably months of hard work disappear just like that. Then what should you do? Is there such a thing as adata recovery freeware? Fret not guys as we have EaseUS Data Recovery Wizard Free to help you out in your time of need. Isn’t it a great feeling that you are able to count on a tool that is able to provide you with the necessary protection and that is also free at the same time? Not only can it assist in data recovery but deleted file recovery as well. This is true if you accidentally deleted some files that you think is not important but only realized about your mistake a few days later. That’s where the data recovery freeware comes into the picture with the largest recovery capacity and the most powerful features packed into it. You can freely use it to recover data due to deleting, formatting, partition loss, improper operation and practically anything else. Also it can help to recover whatever you lost, it could be pictures, videos, audio, emails or in this case; important documents. All-in-all, it is very user friendly and only take a few clicks to get all your lost data back. The software has some of the most powerful data recovery features, namely it offers two progressive scanning modes, one is the quick scan that can help you find deleted files; while another is the deep scan that will help find formatted, inaccessible or lost files. Use it to perform deleted file recovery from your PC, laptop, digital device, server and storage media. While the scan is running, you may at any time to pause and continue; the scanning results can be saved and imported so you can perform another recovery without having to run the scan again. 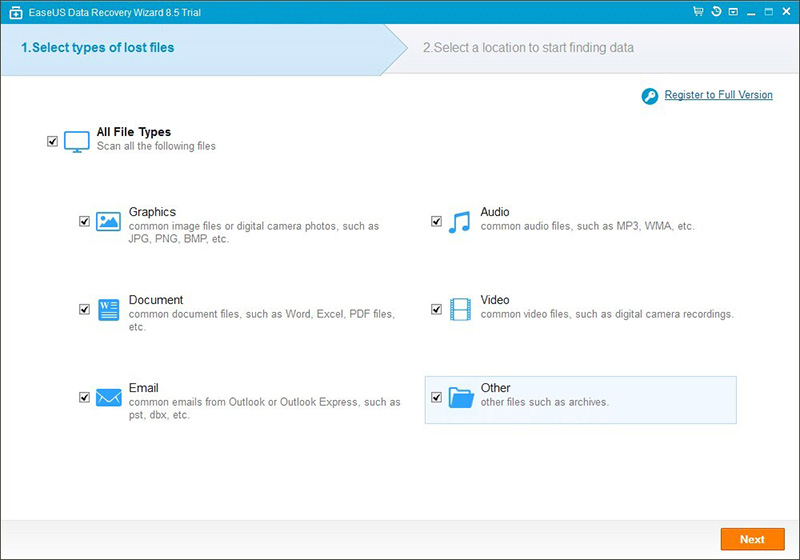 It allows for previewing before recovering where you are able to specify the specific file types before the scanning starts so you will get more precise searching results. Once the scan is completed, you can filter your search by file name, type or date to find files quicker and saves time. Finally, before confirming which files to recover, you can preview the files to check their details and quality before you deciding to recover them. It is very easy to use that practically anybody can use it and it is reliable and safe. You just have to follow the clear and step-by-step instructions and you are on your way to perform the deleted file recovery. There’s an interactive and user friendly interface and all it takes are just 3 simple steps. Finally, it is safe and will not cause any damage to your device or overwrite your data. EaseUS Data Recovery Wizard Free is absolutely free with no strings attached. You just have to download it, install it on your machine and can start using it right away.